"My friends wanted me to paint their two beautiful young cats, so one day I sat down and started thinking about the cats' names - Holly and Ivy. Before I knew it, I was dreaming of winter - of big stone fireplaces and crackling fires, of fire-glow on Persian rugs and pillows of silk and velvet, of antique courting chairs just big enough for two cats if they really like each other. 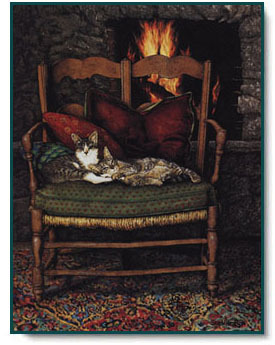 When I awoke from the dream, Holly and Ivy were nestled in the pillows on the chair, and the chair was on the rug in front of the glowing fireplace. So whose dream was it: theirs or mine?" Holly and Ivy copyright © 1992 by Sueellen Ross.